So I am pretty scarce these days, haven't been around for a while, and that is because I have been up to my neck with personal stuff. So for those that wondered what happend to me??? Now you know =) Unfortuanately I work 10-12 hours a day, every day (saterday and sunday included), but soon it will change when we hire a third person to help out with relieving shifts and get a new roster in place. I'll be keeping an eye out though, and be back once things at work comes right and calms down. Firstly I figured I need to start at basics, do some mapping regarding additive and subtractive brushes. For this it has always been relatively simple to assume indoor levels are best done with subtractive brushes and outdoor more suited for additive. And with that, also use basic materials, then move on to meshes and fixing the lighting up a bit, adding particles and making some basic kismet sequences. Also familiarize myself with special brushes again for volume. and finish off with touch up and polishing. The subject? Well I had figured redoing the first and second levels of Unreal, since the first level covers indoors, and the second covers outdoor. Should be interesting to see what I can put together. Also I wont have to spend time sketching the levels, for this I can simply just take a few screenshots as concepts and rework that. 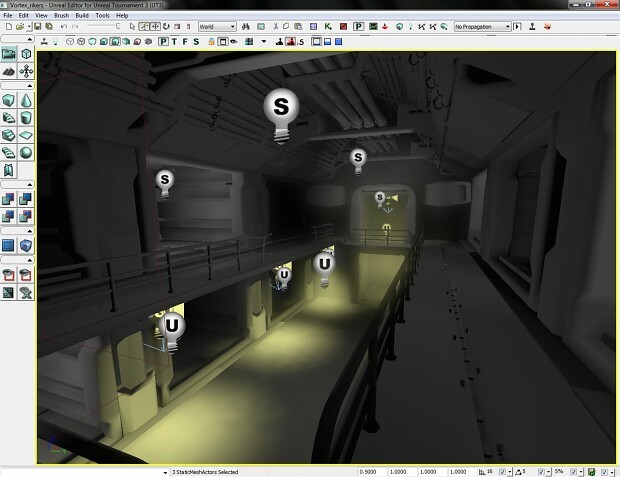 Oh and also I myself am curious to see what Unreal would look and feel like with UE3. 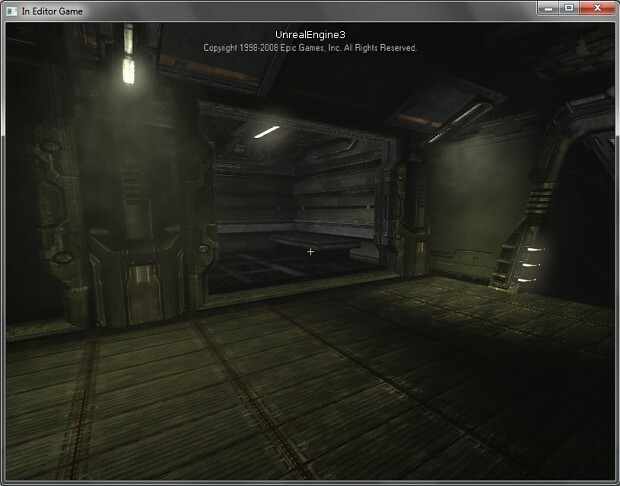 bleh, my UT3 editor crashed after taking this pic, and now keeps crashing when I open the map... I am so bummed right now, cant show any more angles... and I am very tired, I will sort it out tomorrow. I will keep updating the gallery and blog as I progress. Okay so I reinstalled UT3 and got the problem sorted out, so I uploaded more new pics, no comparisons to the old Unreal though... 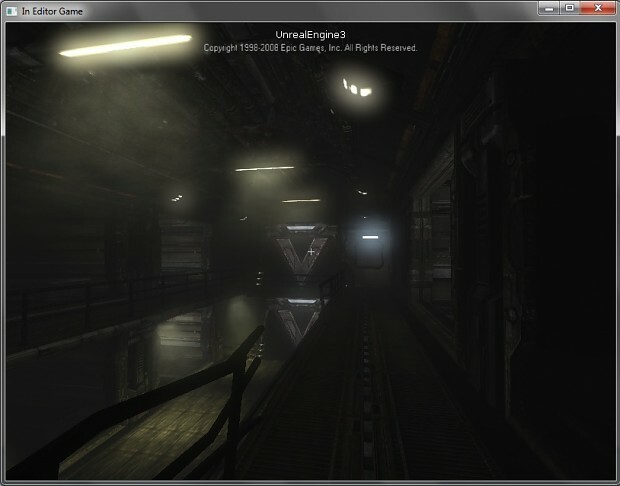 Think perhaps when I am fully done with the level I might add some comparisons. This is just the lightmaps, I took this screen for the purpose of seeing a more lit and detailed view of the map since it is very dark over all. Over all I havent tried to apply any of the actual damage to the ship since it supposedly just crashlanded, But I will do that in time... However the atmosphere currently should reflect that almost pretty obviously in the sense that the power is low, so the lights arent as bright as it should be, and also it has a very smokey (foggy) look to it, so there will be quite a few flames and harmless explosions particles to come from electronics abruptly exploding, and loose cargo and other objects laying around as if they were flung during the crash landing.. And also ultimately I want to see if I can rotate the entire map at a noticeble angle, but not too much that you would keep sliding down and have a hard time navigating, But I think that certainly would also give the right impression. The map itself should be able to tell a story without the need of any cinematics. Although I want to play with matinee, I think I will use it outside once you get outside the ship, so instead of running around Neyal falls, it would transition to matinee as the classic fly cam that wil explore the bits of neyal falls. Anyhow this is the end of update blog 1. Next time I post another will be covering the ducts and the room thereafter. I believe it may be the control room if I remember correctly? Okay so I haven't heard back from anyone aware of a mod based on the Seven Day Siege revolving around the Human and Skaarj war from the Unreal Timeline. Also I can't find any such projects... However I did find some discussions on peoples idea of how it went down, which mostly is based completely in space, I suppose this is heavily influenced on the map AS-Mothership from UT2004, however I don't see how that covers an entire 7 days. So I propose a more elaborated version of the story and base my mod on this story. As for the story, it is currently being worked on by current people I have managed to gather, however this mod won't be an overly complex game structure that is too far-fetched. As for now, I think setting up the game to play out tournament style as UT3 story did would suffice, if at some point the project generates enough interest and attracts some experienced talent, we could sway the project away from tournament play-style and incorporate a modified version of the tournament rules to apply for a proper Single Player game. So far we do have someone volounteering to help out with the scripting for this. Anyhow, this is just me writing my thoughts down, this isn't really a document for the game, there is a more detailed version of the document and it is still under construction as we are working and reworking the story and gameplay as we discuss the game more and more. Once we have a final beta of the document, it will come up for criticism and the lot. So anyone matching the description that wants to contribute their knowledge and experience, will be greatly appreciated! PS: Since it is too early to create a profile for the mod, I will be updating my blogs with progress for anyone interested in this project.. Any comments, opinions and constructive criticism is welcome and appreciated throughout the progress! So far my life has revolved around studies mainly, finding some part time work in town (which there is still no success, IT is such a small portion of this towns industry, and quite frankly, it's all taken up. There are two catches behind getting a job here, the BEE (Black Equity Economy) which basically Afirmative Action for most of you, which I am not black, so I cant apply for those jobs, and then the other catch is to know some people... Unfortunately, I dont know the right people -sigh- So I am most likely to move away to the bigger cities where I do stand a chance. However on another note, I have been contemplating a lot of the issues revolving around attaining a job in the IT field, and figure, perhaps I should take up another field? I have been getting back into my art again (still paper and pencil), so perhaps I could expand on that? Also, I've been trying out modeling on blender, wasn't so bad, but then the new interface I had to relearn, making it a slight bit inconvenient. Anyone have an opinion on an alternative field of study and work that can make do with my artsy talent? I havent really touched my art and modelling in a while, ever since I got my new PC (yay) I have been fiddeling around with UnrealED again, On UT3 I have been mapping some "ART" like designs with no real gameplay in mind, and then also started on the Vortex Rikers map from original Unreal, remade with UT3 assets. I have read alot of queries on a remake of the original Unreal, but it doesnt seem like anyone is really touching it. But why should they? I have found new Dx10 and 11 renders (or renderers?) 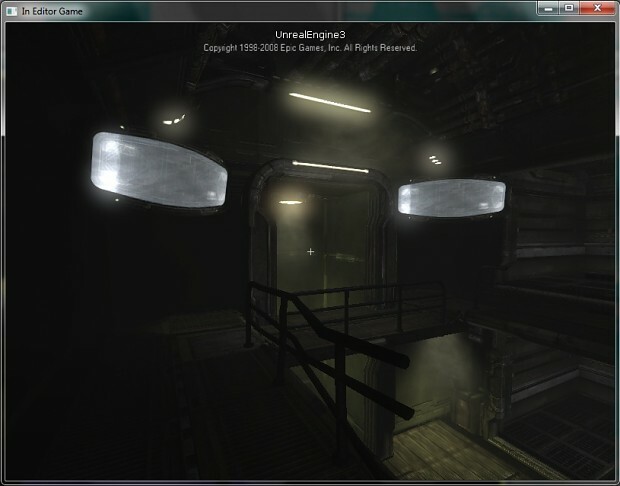 for the engine, as well as some neat S3CTextures... Personally I havent yet had the oppertunity to download and see it for myself, but have been contemplating doing a "revision" mod instead of a remake... 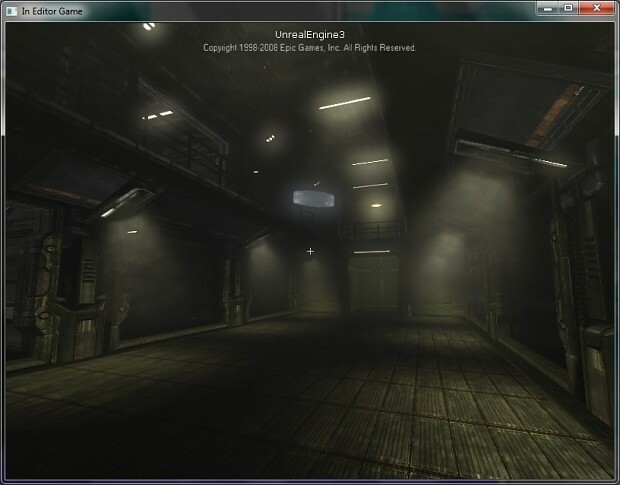 So currently I have been working towards buffing up the levels from Unreal, adding more BSP and detailing out the levels a little more, The power of todays PC should be able to support it, but I will have to test it out with a few maps... Over all with new detailed Maps, and the download of the new S3CTextures packs running along with a Dx10 render/renderer it should look fairly up to date. The only question is, has anyone been able to update the model textures like the weapons and trees and characters? Or I think perhaps just creating new models could be much more useful? Whats happend to the FPS genre??? world of your own? Whats with all the uber realism in games nowadays? something better than CoD in the FPS genre.